Enjoyable children's book, but childishly written. Up in the magic tree house, Jack and Annie are given a riddle by Morgan leFay. To solve it, they must go back in time to have an adventure in the wild west. The bad guys do bad things. The kids lie in order to hide the real reason they came to the village. At one point they go out of their way in order to get a colt to its mother. A cowboy says he doesn't know something that he does know. There is no mention of God in this story. 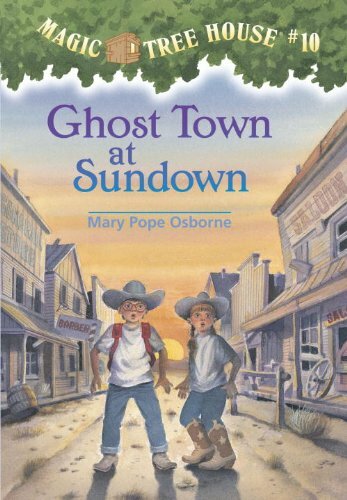 The magic tree house can take someone back in time. Morgan leFay appears, and Merlin is mentioned. A ghost has a prominent role in the story. Jack mentions the possibility of there being a scorpion in a boot; a boy falls off a horse; a rattlesnake gets dangerously close to the kids. A cowboy threatens to shoot the kids and some horse thieves do shoot at them, but nothing is descriptive or unsuitable for most children. The book briefly mentions that a cowboy loved a woman. Nothing other then the slang "shoot" and the nickname "Shorty." There is no Christian content in this book and the writing style was childish, making the book boring for older readers though enjoyable for the proper age group. It is interesting to note that Morgan le Fay is portrayed as good, and fighting against the bad Merlin.